Every time I work on one of these letters I am overwhelmed by the leads they contain and the finite details, discovered and unknown, of the lives that once intertwined with my ancestors. So many people disconnected, so many stories left behind... what a gift that technology gives us the opportunity to re-connect and retrace their steps. I'm disappointed that I can't be at RootsTech this week to enjoy some of those technology advancements firsthand, but I'll be paying close attention to the continued growth of the genealogy community and the opportunities they give story hunters like me to share the past. It is with great pleasure I am writing to you. I had a letter from Winnie Kilpatrick nee (Winnie Atkinson)(one of our cousins) I supposed you remember her. I believe her sister-in-law, Mrs. Tipple has been to see you. Winnie told me how good & kind you all were to them when they were there. I hope you & all your family are well & happy. We are all well just now. Of course I suppose you know that Lottie & Maggie & John died during the last war. I think you must remember Lottie but you may not remember any of the others except Edith. She is living at home with me & also Dorothy as neither of them are married. Nellie is married she is about the same age as your sister Nellie. Lottie & Maggie were married & she left a little girl, she is married & has 2 children a boy & girl, the boy is 5 years old & the girl is 6. Nellie has only one child & he is 23 & he is engaged to be married. I have a photo here that your mother sent me of 2 of your daughters & their husbands & their first baby. I have quite a lot of photos of your relations & one of all the families after your father died. My husband died about the time your mother died. I am 76 years old so I guess I will soon be with them all. I am sending a paper with a map of Australia in it. Winnie tells me one of your sisters are in Melbourne. Which one is it & what is her name? I would like to hear from her. I have written to Nellie Debenham once or twice but she does not answer my letters I suppose like a lot of other people she has not much time & it is hard to write to people you do not know but I am sure you remember me so you will write to me I am sure. Do you remember Jack Campbell he remembers you. Nellie went to see him (at his office) one day & he talked quite a long while about you & he wished to be remembered to you. You would not know the place you used to live your house is still there & so is ours but there are dozens of others & a picture show. We live about 1/2 a mile further on just past the school. We have a much better school than when you were here it is much larger & built of brick. Oh well dear Ben I am about tired I do not often write letters now my hands are very shaky & my fingers ache with holding the pencil. I hope you will find time to send me a few lines soon. Give my love to all my relations over there & lots for yourself & family. My grandmother, Ben’s wife, had a sister named Winifred, but the Winnie mentioned in this letter is not the same. I know of a Winifred Atkinson born to the brother of my grandfather who married an Erikson. And Winifred Pinborough, sister of my grandmother. But this Winnie, Winnie Atkinson Kilpatrick, is new to me. A little creative digging around in Ancestry came up blank. So I headed to FindMyPast and voila - Charlotte W. Atkinson married 1926 in New South Wales Australia to Edgar J. Kilpatrick. Assuming the W must be for Winifred or Winnie, I had a starting point but quickly hit a brick wall. Those brick walls never settle well with me, so I kept digging and assumed that this new Winnie must be closely related to one of my grandfather’s other siblings. As you can see, relying on one resource is never enough. I started with Benjamin Atkinson, not my grandfather Benjamin Atkinson, but his father’s brother, and quickly found his first wife, then hit another wall. Then, patiently persistent, I found his grave records and a different wife, must be the second wife... From there I stumbled my way into a Will on Find My Past in the New South Wales Will Books 1800-1952 archives. And low and behold, there she was, the Winnie I was seeking, named in the will, Charlotte Winifred Kilpatrick, right along with a bunch of other folks just waiting to take their place on my family tree including: Nelly French wife of Eric Richard French, Martha Miriam Palmer wife of William Palmer, Edna Adeline Atkinson, Benjamin Charles Atkinson (yes, another Benjamin! there are so many), Charlotte Winifred Kilpatrick wife of Edgar Joseph Kilpatrick, and Joan Winifred Kilpartrick. This was a lucky day indeed. And a reminder, don’t stop when you hit the wall! Just blaze on through. Now as a result of all this sleuthing, I will have to later determine what happened to my 2nd great uncle Benjamin’s first wife, Harriett Elizabeth Coleborne born 1863 and married to Ben in 1890. Ben married his 2nd wife Miriam in 1896 so that’s a skinny six years to navigate. The hunt for her will resume at a later date. I'll also go a searching for Winnie’s "sister-in-law", Mrs. Tipple, who must be one of Edgar Kilpatrick’s sisters that married a Tipple and made her way to Salt Lake City, Utah. I think I've seen the name Tipple somewhere in all these boxes. Don’t Be Shy. Ask Questions. Ask Everyone. One of the many beautiful things about Ancestry.com is the ability to connect with others that share links in your family tree. I have found other researchers to be incredibly kind and generous over the years so don’t be afraid to send someone an email and ask a question or two, or three, even if they are not directly related to you. This was the case when I was trying to find why “Lottie, Maggie & John all died during the last war.” Were they all away fighting or supporting war efforts? I started researching and remembered there was a user that kept showing up with those delightful green leaf clues when I first starting researching the Haskins. So I sent her a quick email and she was quickly able to provide me with some insight. It could have taken me hours to delve into the 1917 deaths of these three siblings Lottie, Maggie & John, but my potential research anguish was alleviated a bit by this kind woman who was working on a tree that shared branches with mine. Margaret “Maggie” Balaam died 7 Dec 1917 aged 25 years. Cause unknown. Charlotte Haskins Gordon died 13 Nov 1917, buried 13 Nov 1917. She was 29 years old, married to James Marks Gordon [Source: Queensland Death, Queensland Funeral Records, Australia Death Index, Australia Electoral Rolls] Given that I found her death and burial were on the same day, the possibility that she died of TB or some other infectious disease seems possible. It took a little more digging, first through FindMyPast then off to FamilySearch.org and I finally found she was buried in Toowong Cemetery. Mentioned in this letter is her surviving “little girl” Joyce, who is also mentioned in previous letters along with a photo. 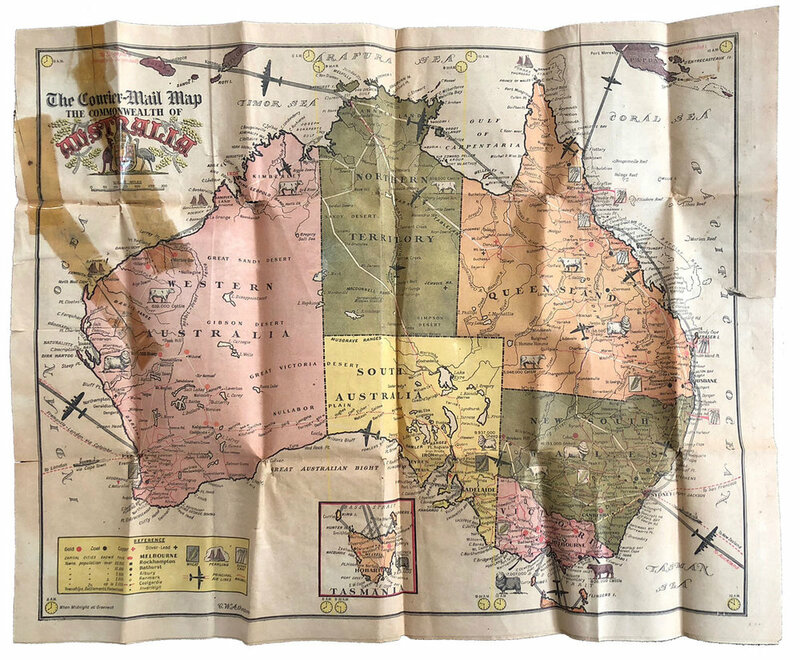 The Courier-Mail Map of the Commonwealth of Australia, Monday February 26, 1945. Note the key in the left corner and the livestock pictured throughout. Incredible! Can you believe what a treat this map is?!! How lucky am I that my grandfather, grandmother, mother, father held on to it. This one is getting framed and going on a wall in the house.